Mix Juice Apple and Blackberry Pie is a gorgeous mix of juicy Apples and fresh Blackberries – baked inside a buttery pastry pie base. A sublime dessert blend that will leave you wanting more! So good you’ll wish you could have it with custard! 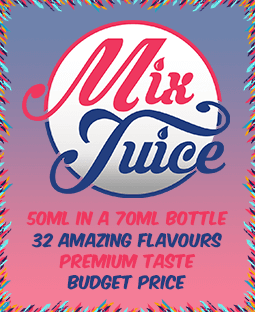 You can buy your Mix Juice Apple & Blackberry Pie on its own, nicotine free or you can add 10ml or 20ml or Nic Shot to create your desired strength.